Exclusive design eliminates the need for mounting holes in the tank. Delta toilets are engineered with our exclusive SmartFit Tank-to-Bowl Connection to reduce potential leak points and over-tightening of the fasteners, which could crack the toilet. Our design eliminates the need for mounting holes typically found in the bottom of the tank, using a metal bracket to secure the bolts to the bowl. Each Delta toilet comes with the three bolts preassembled to the mounting plate, making installation a breeze. I've never installed a toilet prior to the Delta Prelude, so I cannot speak as to how easy this one is to install vs others, but I can say that it's pretty easy in general. I really dig the fact there is a bracket at the bottom of the tank that eliminates the need to have bolts going through the bowl, this eliminates the worry of having any future leaks and makes the install super smooth. The toilet uses way less water than my previous American Standard toilet, and appears to get its flushing power by releasing all of the water into the bowl at one time vs the old swirling in method. The flush is quick and efficient. The only downside I have experienced with this is the fact it doesn't always clean the walls of the bowl. I guess I could also throw in the fact that the toilet seat is very cheap feeling, so much so that I am looking to swap it out. 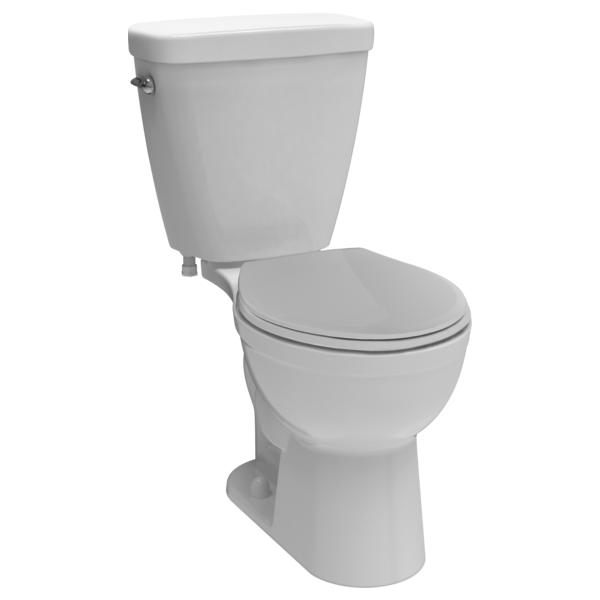 The toilet has great lines and has a very clean profile, which will enhance any modern bathrooms athletic quality. This toilet get this review for excellent based on the noted features that are proven to be true...the exclusive SmartFit tank-to-bowl connection reducing potential leak points, over-tightening of the fasteners and cracking the toilet Maximum flush power while saving you money. I have never install a toilet and this one made my job easy. The product is beautiful and semi quiet. The toilet came with everything I needed to complete the job except the water supply line. Excellent product. What is the SmartFit tank-to-bowl connection? Delta toilets feature the exclusive SmartFit tank-to-bowl connection. The SmartFit system reduces potential leak points and over-tightening of the fasteners, which can crack the toilet. Utilizing a metal bracket on the bottom of the tank to secure the bolts to the bowl, the SmartFit tank-to-bowl connection eliminates the need for holes typically found in the bottom of the tank. For the convenience of the installer, the three bolts of the SmartFit connection system on Delta toilets are preassembled to the mounting plate. Are Delta toilets with SmartFit covered by a warranty? Yes. The china components, mechanical parts and toilet seats are warranted to the original consumer purchaser. Limitations apply. See the Delta Toilet Limited Warranty for details. Where can I purchase a Delta toilet with SmartFit? Delta toilets are available at The Home Depot and www.homedepot.com. How do I install a Delta toilet with SmartFit? Detailed instructions for installing a Delta toilet are provided in the Installation Instructions that come with your Delta® toilet. These instructions are also downloadable on the product information page for your Delta toilet model (see deltafaucet.com/toilet) or watch our video on how to install a toilet.